Enjoy. Bon appétit! Merci, René, Sonny et Érick. Je vous aime. Yesterday I fell in love with a man, his dog and a mountain. After last Friday’s truffle market in Carpentras, Chef Érick and I were invited to have lunch with René, pictured above, and Françoise, his wife, at their home in Isle sur la Sorgue in the Vaucluse. René called on Tuesday of this week to confirm that we were coming. He asked me if I am afraid of walking in the mountains. He did not know he was talking to a mountain girl. And then he told me not to wear my high heels. Since I do not own any, that would be easy enough. He also reminded me that we needed to get there early. So, I dressed warmly, lacing up my tennis shoes, and we set out around 10:00 am. Isle sur la Sorgue is about an hour’s drive from Arles. We drove through fog for about 30 minutes and after it lifted, we could see Mont Ventoux in the distance, covered with snow. When we arrived in the town well-known for its antique shops, Érick pulled off to the side of the road to phone René because he was unsure of how to find his house. René gave him directions and said he would come find us on his bicycle if we got lost. We set out again and, sure enough, at the turn to his neighborhood, there sat René on his vélo. We followed him home. We were greeted by the barking of Sonny, his white lab. Françoise had prepared a feast for us. We ate shrimp, paté de fois gras and smoked salmon on toast and radishes as appetizers. Then Françoise made omelets with truffles for the next course. René brought out a bottle of red Côtes du Ventoux wine and uncorked it. The omelets were followed by endives baked with ham and cheese with truffles sprinkled inside. Lunch conversation consisted of René telling me about his teaching days at the nearby high school and Érick instructing Françoise on the proper way to prepare truffles. He told her that truffles should not be cooked. They should be added to a dish after it has been cooked. Heating them causes them to lose their flavor. Françoise seemed very grateful for the advice. We had cheese, a little dish of ice cream and coffee before setting out on our adventure. Françoise elected not to go (probably because she had so many dishes to wash…) and she lent me her boots. René loaded Sonny into the truck and off we went. I really had no idea what to expect. I did have a vague recollection of oak trees and roots after reading Peter Mayle’s books. We parked by the side of the road and found a little path up the mountain where René owns property and where he does his hunting. I followed behind René and Sonny, keeping a bit of distance between us so as not to distract her. I learned to walk in the grass or on the moss, not on the dirt path. Lesson #1: leave no tracks for others to see. Lesson #2: whisper so that your voice doesn’t carry. Others are probably around, hunting for truffles, too, poaching most likely. It is still a bit early in the truffle-hunting season and I had been warned not to expect too much. So, it was a pleasant surprise when Sonny started digging about 10 minutes into our walk. As soon as she begins to dig, René hurries over and scoots her out of the way. She has no interest in eating the truffle, however. I had read about hunting with pigs, but pigs like to eat the truffles. We did see lots of places where wild boar, sangliers, had beat us to the treasure. Once René finds the diamant noir, or black diamond as they are known in France, he rewards Sonny with several dog treats from the little bag he keeps in his pocket. He tells her what a great dog she is and pets her. It is obvious that he loves her dearly and she is fiercely loyal to him. She decided that she kind of liked me, but I think it was because I was wearing Françoise’s boots, to be truthful. René then checks out his treasure, smelling it and carefully rubbing some of the dirt away in order to see if it is a good one. He can tell immediately if it is too wet or too dry. If so, it will not fetch much at the market. There are stories of fake smell being added to the truffles, lead pellets being inserted into them to make them weigh more, poachers who steal from the property owners, and so on. This seems to be a business based on trust, however, and René is a man of his word. He taught high school for about 30 years and loved it. He has hunted truffles for over 40 years. He took great pleasure in showing me how he goes about it. I am deeply grateful to him for the lesson. We spent about two hours following Sonny’s nose and a little path up the mountain. 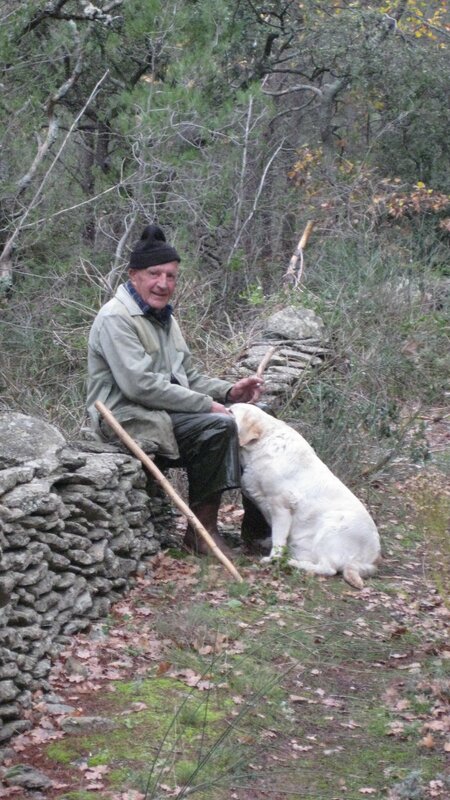 René remembers where he has had success in the past and guides the dog towards those places. She, however, is guided by her nose and her knowledge that a treat awaits her should she find a truffle. We came out of the woods with 11 truffles of various sizes. René even let me dig one up. He carries a small screwdriver in his pocket for this purpose. He places his truffles in a small white plastic sack. His jacket has lots of pockets to hold all the tools of his trade. At first glance, I thought his René’s mountain resembled the Appalachian Mountains, my home. However, once we started climbing up the path, I realized there was not very much resemblance at all. Snail shells are scattered everywhere. A wall made of stones winds up the mountain, built from the flat rocks that are found everywhere. Small stones huts, bories, are hidden away, built long ago by shepherds as shelters while they tended their flocks of sheep. I ventured into one of them, admittedly not very far as it was very dark and I am not too fond of spiders, even French ones. The oak trees are not large ones, as I had expected. They are small and different from any I have ever seen. All in all, it was one of the best days of my life. René is a master storyteller and continued to tell me stories after we returned to his house. 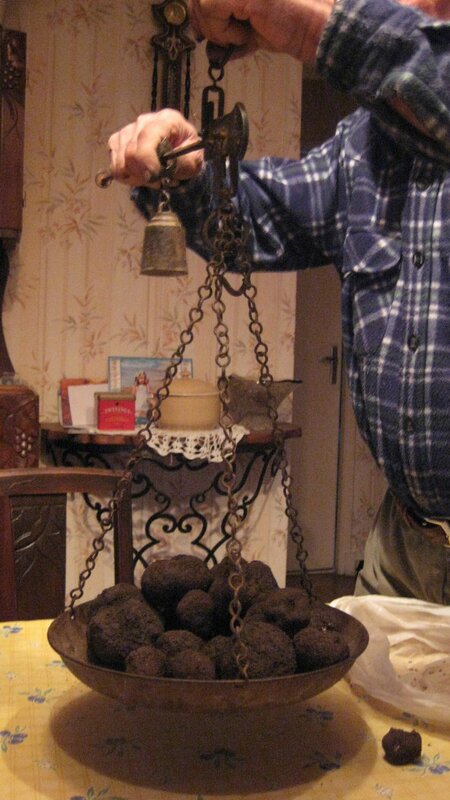 He pulled out his scales, a basic set, nothing fancy or digital for the truffle hunters here in the Vaucluse, and weighed the week’s findings, coming to almost a kilo or 2.2 pounds. He gave me two small ones. I just ate one of them grated on top of fresh pasta. To really get a taste of a fresh truffle, take a small piece of bread, dip it in olive oil, grate the truffle on top and sprinkle it with coarse sea salt. Heavenly. In one week’s time, I have become addicted to truffles. I just had dinner and am already thinking about tomorrow’s lunch. I plan to make an omelet from the fresh eggs we just bought, add some cheese while it is cooking and then grate my last truffle on top. I only have nine days to savor as much of Provence as possible, after all! Here is the dish we made last week, after the market in Carpentras. This recipe is courtesy of Madeleine Vedel. This is rightly a recipe for the fall, but it can be made all year round with a stash of dried mushrooms. The walnut sauce is a classic preparation that dates back to the time of the Etruscans. Walnuts are particularly present in the Cévennes, the hills of the Gard in Languedoc, just an hour or so from Arles. Fresh pasta is really quite easy to make. Anyone who’s made bread a few times, can easily start making pasta. From start to finish, this recipe can be on the table in an hour after a bit of practice. If served as a main course, one egg per person, if served as a side dish, then one egg per 2 people. One cup (100-150g) flour to one whole egg. 1/2 cup of olive oil (120ml)– not too bitter, extra-virgin cold pressed. Grated cheese – we like a young sheep tome, or pecorino. A mild parmesan is fine, too. On a smooth work surface, such as a large counter space or marble slab, pile your flour in a well, in the middle of the well put your mushroom powder and your pinch of salt and your eggs. With your hands, gradually incorporate as much flour as the eggs are thirsty. If there is a bit of flour left over, you can add a tablespoon or so of water, as needed. You need to work the dough for at least 10 minutes, kneading it and stretching it, till it is smooth to the touch. Put aside covered to rest for 30 minutes. Either with a pasta machine or by hand, continue rolling and folding the pasta dough. With the machine I pass a portion of the dough through, fold it in three and pass it again, always on the largest setting. I continue this at least 7 times, if not more, till the dough is very smooth and elastic and does not seem brittle and cracks stop appearing. When the dough is ready, then you can either roll out by hand, turning the dough in every direction, gradually increasing its elasticity and thinning it out, the pros use a bit of gravity letting the dough hang off the counter as then roll. Or, alternatively, use the pasta machine and gradually reduce the size of the setting to the desired thickness. When the dough is the thickness you desire, cut it as you please, in large long noodles, in triangles, in thinner spaghetti lengths… to your preference. Lay the prepared pasta on floured cloths, – you can layer these – and let dry till you are ready to put them into the salted boiling water. In a mortar and pestle, grind your garlic cloves and walnuts to a fine paste, add the olive oil as you work to make it easier to form the paste, if you are adding the mint leaves, do so now, and salt to taste. When your pasta is done, save some of the pasta water to add to the walnut sauce to lengthen it and thicken it. Toss the pasta with the walnut sauce, grate the cheese on top, and serve. If you are using truffles, grate them on top of the pasta, sauce and cheese. Have fresh bread ready in order to wipe your plate clean so that you do not waste one bit of the sauce or truffles!